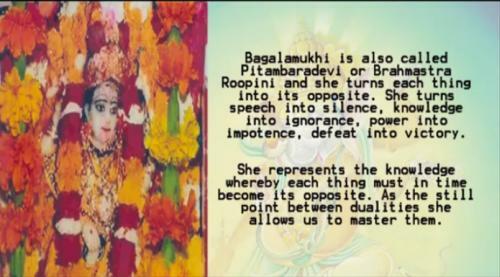 Bagalamukhi: Bagalamukhi or Bagala is one of the ten mahavidyas (great wisdom goddess) in Hinduism. Bagalamukhi Devi smashes the devotee’s (or devotee’s enemise’) misconceptions and delusions with her cudgel. She is also knows as Pitembara in Northern parts of India. Bagalamukhi represents the knowledge whereby each thing must in time become its opposite. As the still point between dualities she allows us to master them.